We can offer a range of duplication services from most formats to VHS, DVD or CD with or without time code. Formats we can duplicate from are: - DVD , CD, DV Tape ( Cam , Mini and Digital 8), S/VHS or VHS, C format, Hi8 or 8mm plus Betamax. All formats can be loaded to are editing system for remastering to DV Tape, DVD or CD in PAL or NTSC. 8mm or super 8 cine films could be over 40 years old and silent, very few films have sound. The spool sizes are: 3inch spools = 50ft, 4.5inch spools = 200ft and 7inch spools = 400ft. All cine film is cleaned and checked before digital transfer via Firewire and onto a time line. 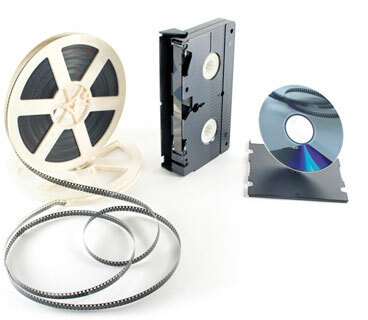 At this stage your cine film can be rearranged if out of order, a chapter point will be added at the start of every spool, titles can be added and we will also try to improve the picture quality if necessary before transferring your cine film to DVD or tape.